While any “Parisien” will tell you that 3 days in Paris is far too short a time to explore the City of Lights, it’s definitely enough to visit the main attractions. We’ve gathered the best budget-friendly tips from locals, and compiled an essential itinerary to make the most of your 3-day tour of Paris! 1. Accommodation in the city center may seem pricy, but will cut down significantly on commute time to the city’s major attractions. Compare prices, shop for deals and discover the wide variety of hotels in Paris to stretch your budget. 2. Use public transport — avoid Hop-on hop-off buses if you want to experience Paris like a local! The RATP website and mobile app are great for practical info, including departure times and ticket prices. 3. 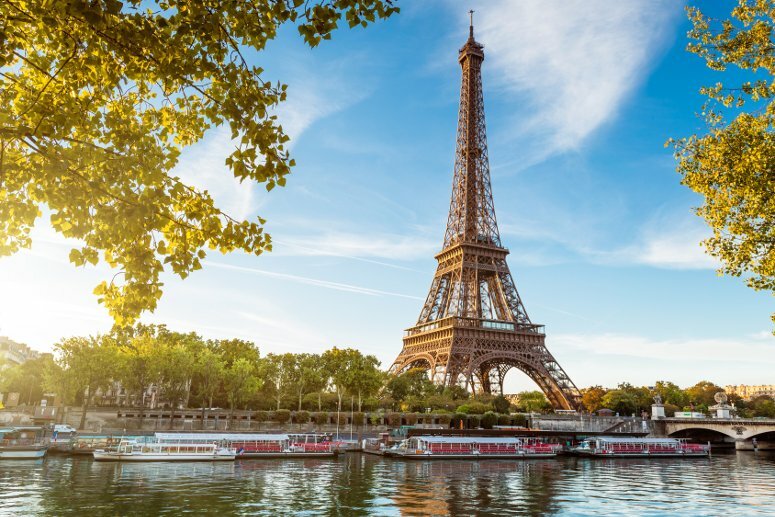 Enjoy Parisian food like a local — grab a bite from street vendors, have a picnic in one of the city’s gorgeous parks, and skip the fancy bistrot in favor of local markets. Don’t forget, some of Paris’ best cheap eats aren’t French, so go ahead and try some ethnic options! 4. Don’t wait in lines — buy your tickets and make reservations ahead of time. Parisians hate waiting in line, so plan ahead! Check out the official Paris tourist office website. 5. Beware of pickpockets! Stay aware of your personal belongings, especially in crowded tourist hotspots. Our suggested itinerary starts with a visit at the Musèe d’Orsay, home to masterpieces by the likes of Monet, Manet, Degas, Rodin, Gauguin and many other famous impressionists. A couple of hours will give you a quick taste of this museum, whose beautiful building was converted from a train station. For lunch, treat your tastebuds to a quintessentially French crepe from Food Breizh: this small kiosk nestled between the museum and the Seine offers savory and sweet options that won’t break the bank. After a quick look at Place de la Concorde, Paris’ largest square and site of most guillotine executions during the French Revolution, head over towards the Petit Palais, home to the Museum of Fine Arts. Admission is free, and the permanent exhibit hosts a number of masterpieces that are well worth a visit. Take a stroll down the world-famous Avenue des Champs-Elysees, a symbol of Parisian luxury and style. Shopping here can be very expensive, so skip the shops and enjoy the view — perhaps stopping for a snack at LaDurée, the patissier that invented the macaron. 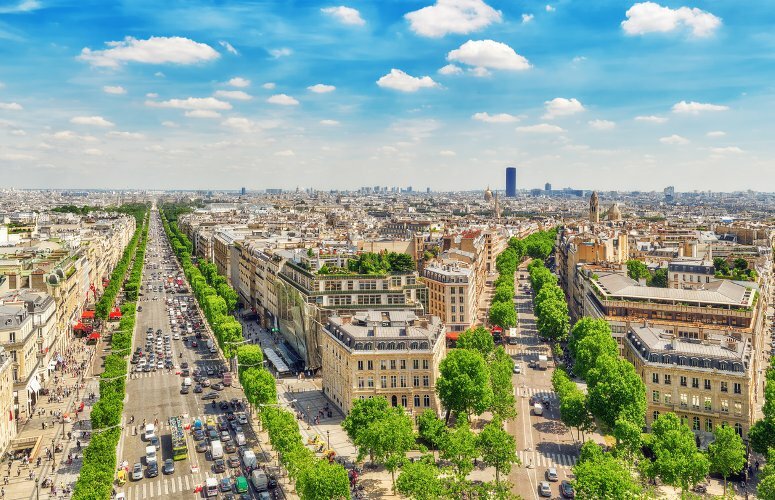 Continue down the monumental avenue to the end, where the spectacular Arc de Triomphe towers over Place Charles de Gaulle, or what the Parisians call “Place de l’Etoile”, after the 12 avenues that radiate from the Arc. Time and cost-saving tip: lineups can be very long, so skip the rooftop climb and enjoy a much better view of the city from the Eiffel Tower, our next stop. Affectionately called “The Iron Lady” by locals, this instantly recognizable landmark is brightly lit and twinkles with a truly magical light show every hour, on the hour. Don’t forget to book ahead, lines are often very long. End your evening with a taste of classic French cuisine at nearby Café Constant, a favorite among the locals for its good food, friendly service and honest pricing. Your second day starts on the Île de la Cité, where you will find 2 of Paris’ most famous places to visit: the Sainte Chapelle and the Cathedral of Notre Dame de Paris. 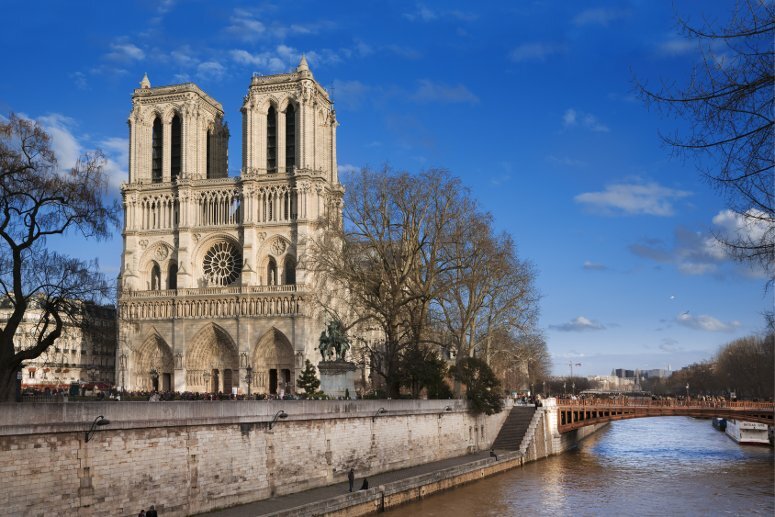 Morning hours are ideal for admiring their stunning stained glass windows, and the iconic towers of Notre Dame will reveal a spectacular view of the city. Our next stop is the Pantheon, once a church but now a mausoleum for the country’s most famous icons; science buffs will also appreciate seeing the original Foucault pendulum, which demonstrates the rotation of the Earth. Depending on the weather, you may be able to catch a guided tour up to the top of the dome for a 360 degree view. Take some time to stroll around the lively neighborhood, called the Latin Quarter after the language once spoken by students of the nearby Sorbonne University, founded in 1257. Here you can find some of Paris’ best street food, which makes it an ideal spot to grab a quick lunch: we suggest local favorite Chez Le Libanais, serving some of the best falafel in town. Alternatively, you can load up on fresh baguettes, a selection of charcuterie and a good bottle of wine, and head over to the peaceful Jardin du Luxembourg for a typical Parisian picnic. Take a little time to relax and explore the many statues around this beautiful park, including a smaller version of New York’s Statue of Liberty. After a quick stop at the newly renovated Saint Sulpice church, dedicate the evening to the Louvre Museum and its surrounding park, the Jardins Tuileries. 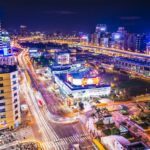 This museum is famously huge, and it can be very hard to decide where to go and what to see, so check out the map ahead of time; locals try and avoid rush hour by taking advantage of late evening opening hours on Wednesdays and Fridays. The Mona Lisa and Venus de Milo are just the tip of the iceberg here: among its over 30 000 pieces on display, we’re sure you’ll find your new favorite. Start off the last of your 3 days in Paris with a leisurely stroll around the Marché aux Puces St-Ouen, the legendary flea market for bargain hunters and antiques collectors that attracts curious visitors from all over the world. 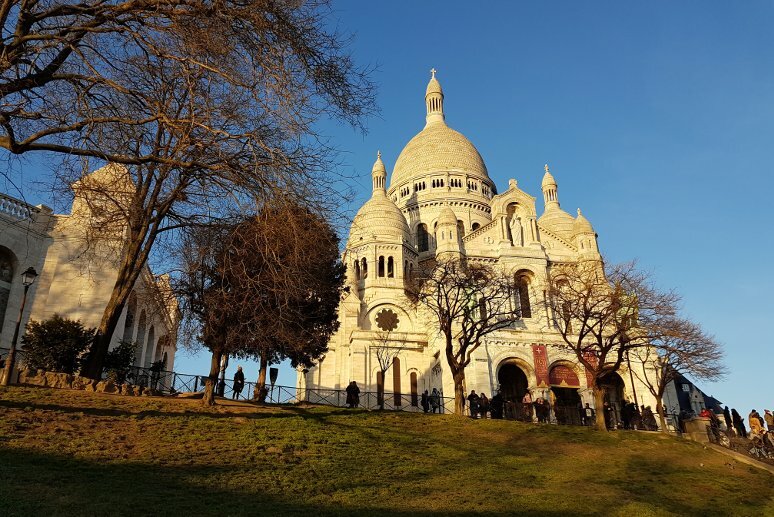 At the heart of the charming neighbourhood of Montmartre, you will find the iconic Basilique du Sacré Coeur, a monumental 19th century church built out of white marble. The surrounding district, long known as the artistic hub of the city, is lively and picturesque; get lost in its alleyways and cubby holes, before taking a break for lunch in one of its many eateries. We recommend stopping by the boulangerie Coquelicot, a traditional bakery where locals get bread and pastries, as well as breakfast and lunch served on-site. Heading down Boulevard Haussmann, you can visit the spectacular buildings of department stores Galeries Lafayette and Le Printemps. Their early 20th century rivalry produced the lavish architectural jewels that can be admired today — just don’t go crazy on the shopping, if you want to stay on budget! A quick stop at the Palais Garnier Opera House, setting of the famous “Phantom of the Opera” novel and musical, before heading over to our last stop in our 3-day tour of Paris: the Centre Pompidou. This museum of modern art is one of the most unique-looking buildings in Paris; don’t miss the view from the 5th floor, especially spectacular at sunset. If you still have time for dinner before you leave, stop by Candelaria for tacos, drinks and a fantastic atmosphere that locals recommend. Is 3 days enough to explore Paris? 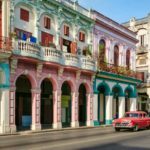 Probably not… But with a few tips from locals, you can get a feel for its atmosphere, and enjoy a taste that will have you coming back for more.